Black color. Hold your small panels for beautiful accent lighting. Solid brass finish. Two canal fan base is food to present the collection of design for fan lights & multi-sided project lamps. Zinc alloy with antique finish, without wire and socket. Zinc alloy with antique finish, without wire and socket. 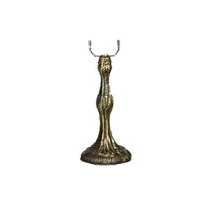 Zinc alloy lamp bases are with FINIAL & HARP, but without electric parts. Our zinc alloy lamp bases are electroplated into bronze color, so color may be different each production. Solid brass lamp bases are not included wire, these Premium Lamp Bases are with high quality, and the most authentic & exquisite lamp bases, with less MOQ requirement than others.